The Chrome DrillBot is a limited edition Physical type weapon. While drilling through clumpy top soil around Digby, the scientists there became tired of constantly cleaning the drills. Their solution? Coat the drills in slick chrome! Overcharged and super-powered, the Chrome DrillBot obliterates mice in style! The Chrome DrillBot is a Limited Edition weapon and can no longer be acquired by Hunters. It was available to be purchased for 897,400 gold from Ronza's Traveling Shoppe during The Great Winter Hunt '09. It could be refunded for 161,532 gold at the same location. The Chrome DrillBot has the special property of acquiring Scrap Metal loot from Steel mice. Digby DrillBot – The base version of the DrillBot. RhinoBot – Requires Digby DrillBot Parts for crafting. 23 December 2009: The Chrome DrillBot was introduced, but was not available for purchase. 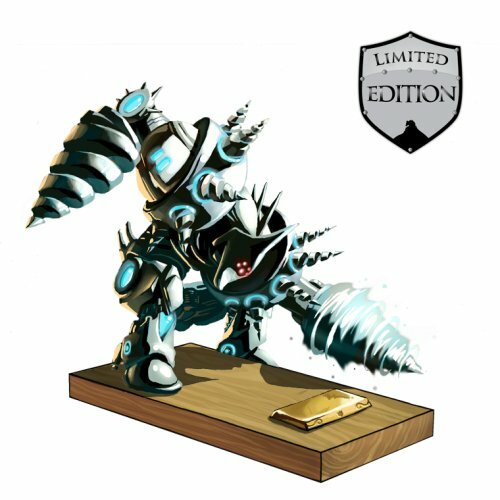 28 December 2009: The Chrome DrillBot was made available for purchase. This page was last edited on 13 January 2019, at 13:12.